Good morning! If you’re on Baby Watch, there’s no action yet (as of last night around midnight). But I’ve gotten my pre-childbirth pedicure and finished putting my labor & delivery playlist on my phone, plus I’m completely over having this back pain, so he can go ahead and fire at will. As long as he gives us time to get to the hospital (my big fear is not making it to the hospital). 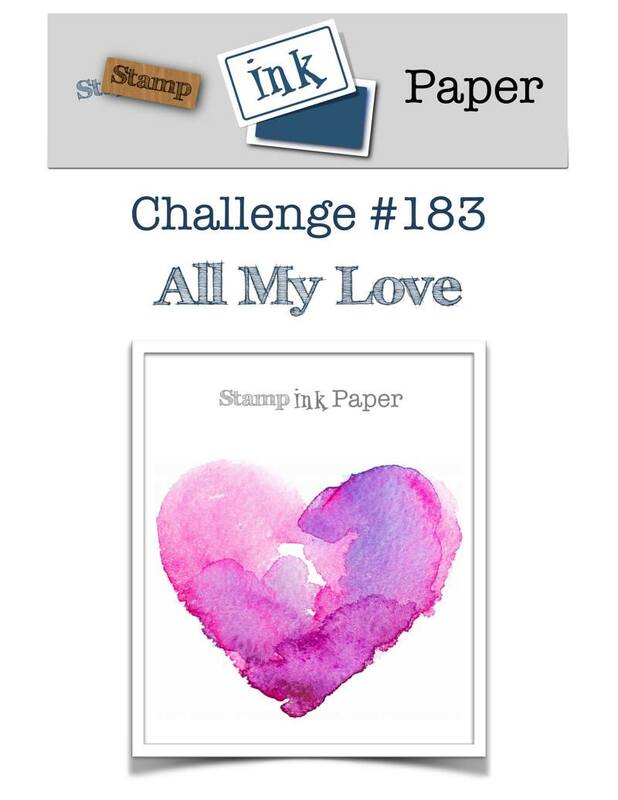 Anyway, we have an “All My Love” challenge for you at Stamp, Ink, Paper this week. In my Facebook Live video on Wednesday, I made a bunch of backgrounds using the Ink Smooshing technique. I used two of them on my card and decided to make a masculine Valentine for my husband. It can still be masculine if it has hearts and a bow on it, right? I started with a Blueberry Bushel card base, which you can’t see here. But trust me, it’s there, and it’s 4-1/4″ x 11″, scored at 5-1/2″. 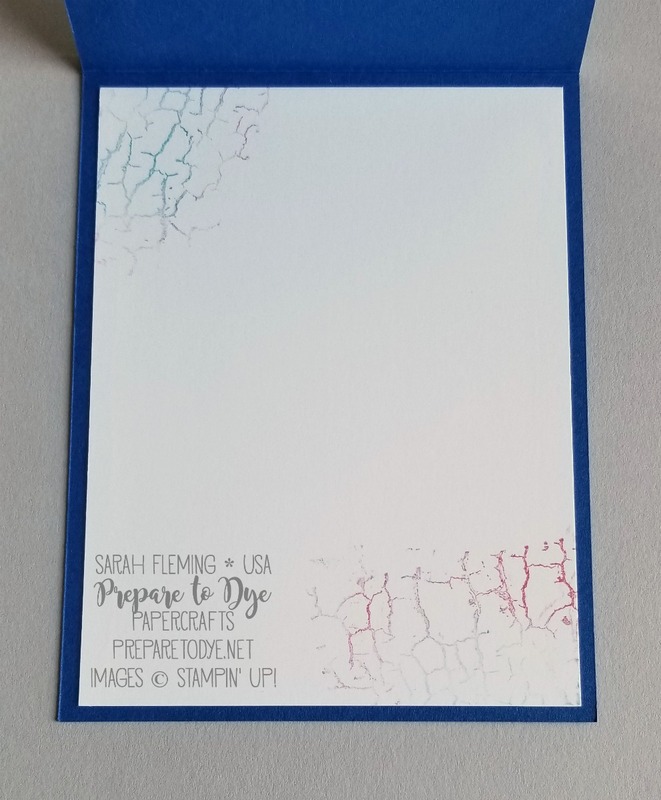 Next I cut a piece of Whisper White, 4″ x 5-1/4″, and I stamped it with the Crackle Paint background stamp. 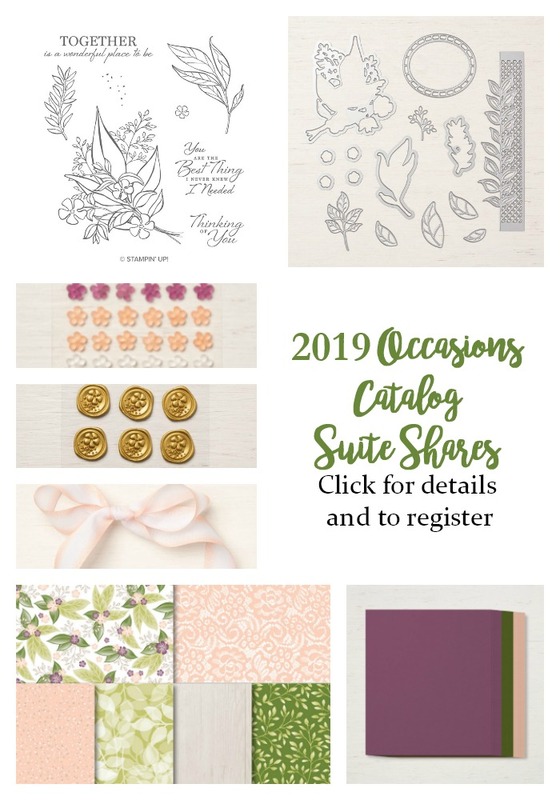 I sponged Blueberry Bushel and Crumb Cake onto the face-up stamp in various spots, but then some parts stamped a little orangey… Well, the last time I used this stamp, I stamped in Calypso Coral, and I’m thinking maybe I didn’t clean the stamp… oops. Anyway, I laid the card down on the inked stamp and tapped the paper in a few spots, but not everywhere, which is why it isn’t stamped all over (this is the look I was going for). I had made one smooshed background on watercolor paper with Blueberry Bushel, Shaded Spruce, Crushed Curry, and Crumb Cake (which didn’t show up anywhere, so I left it off the supply list) on watercolor paper and also made one on Glossy White Cardstock. I wanted to use them both on this card, so I cut a frame using the Rectangle Stitched framelits. I saved the other piece for another project. I trimmed the paper to 4-1/4″ x 5-1/2″ and popped the frame up on Dimensionals. I cut out the smooshed watercolor background that uses the same colors with the Be Mine Stitched framelits, the second largest framelit (which only cuts the stitching), and the largest scalloped one (which cuts a scalloped heart and this inner heart). 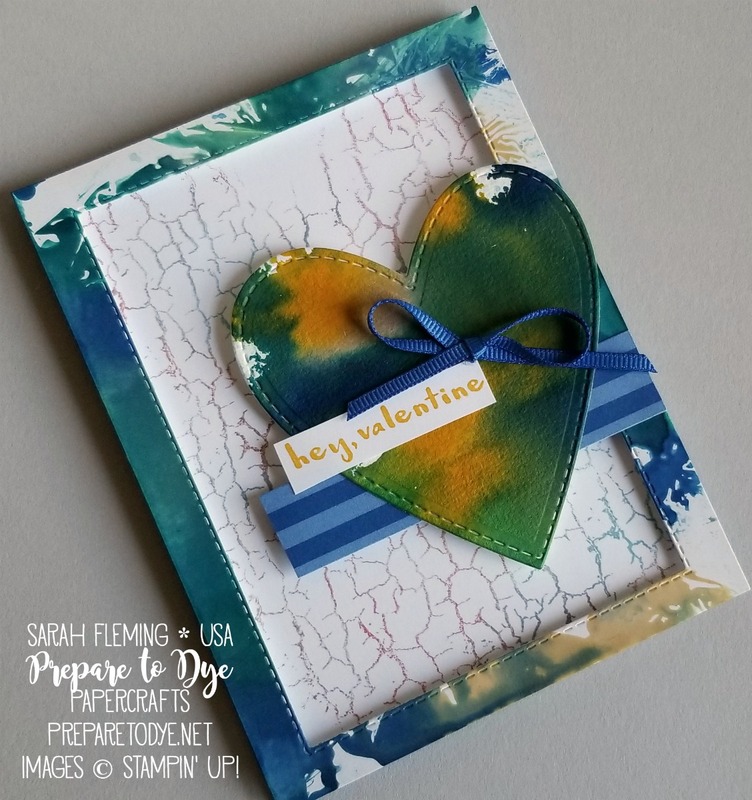 I had a scrap of Blueberry Bushel designer series paper, so I put that on the card behind the heart, both on Dimensionals. I stamped the “hey, valentine” sentiment, from the adorable Hey Love stamp set, in Crushed Curry on a scrap of Whisper White cardstock and snipped it out and added it to the card. I finished off the card with a bow I made from Blueberry Bushel 1/8″ Grosgrain Ribbon. Inside I added a piece of Whisper White, which I pressed onto the inked Crackle stamp in a couple of spots (I didn’t reink it, just huffed on it to reactivate whatever ink was left on the stamp). 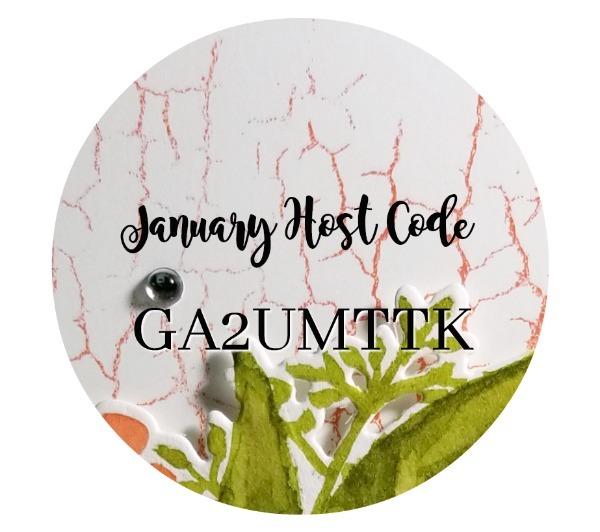 I hope you love my card and that you’ll try Ink Smooshing and that you’ll also head over to the Stamp, Ink, Paper blog to play along with our challenge!